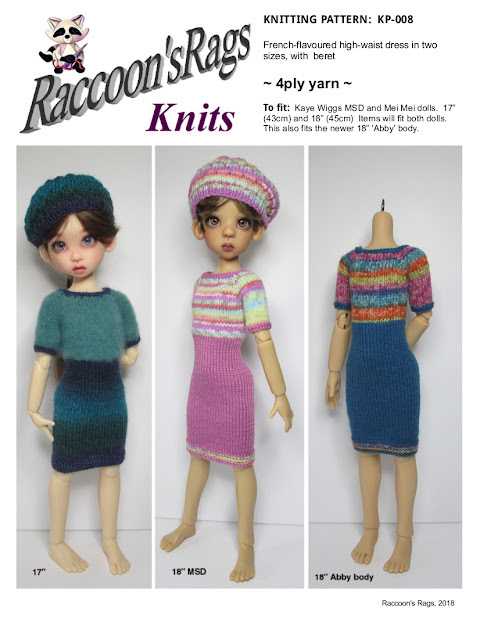 Raccoons Rags: KP-008: High waisted dress and beret knitting pattern for Kaye Wiggs girls. KP-008: High waisted dress and beret knitting pattern for Kaye Wiggs girls. After all the coats and sweaters, something more girly was in order, so I've come up with these little high-waist dresses for our Kaye Wiggs dollies. The dress is knitted in 4ply, and I've used variegated yarns for the top and plains for the skirts, and vice-versa. For this 18” doll purple/rainbow dress, I've used Scheepjes Catona cotton for the main colour (skirt) and Sirdar Snuggly Crofter Baby 4ply in contrast colour. Next is Gracie, my 17" girl. She has a separate pattern. Both dresses fit both dolls, but as the Mei Mei body is a bit bigger around the bottom, and she's shorter, I've created a slightly different pattern for her. For this peacock greens dress, I've used Drops Delight 4 ply for the main colour (skirt) and Phildar Phil Light for the contrast colour. Phil Light is actually a 3 ply yarn, but it's so fluffy, it knits up well for this dress on the 3mm needles. I've brushed the yarn too, to bring up the fluffy pile. And finally, here's another one, shown on my lovely new Missy (Abby body) Please excuse the lack of head, but she's with Dr Krowe for a makeover. For this I've used an unbranded acrylic 4 ply oddment for the main colour (skirt) and King Cole zigzag 4 ply for the contrast colour. Different yarns do knit up differently, but I've made this, and the beret in several different types to try them out, and all look lovely on the dolls. More lovely knits - makes me want to make knitted dresses for the Ells again! Love the Scheepjes Cantona with the Baby Crofter. I do love Baby Crofter that's what I used for my dress for my Le Cheries Clara... she looks very cute and girlie in it! Gracie as ever you look lovely - such a cute model! I'm knitting for a Disney Animator Toddler doll at the moment! :) I want to move on to something for Ell too. I think a knitted dress would be lovely, but I don't like the scale of 4ply on Ell, and people don't seem to want to buy knitting patterns for finer yarns... not very much anyway. But hey ho, I'll find something to do. Baby Crofter is fab :) I've been tempted by the animator dolls myself, but aren't they really big? The animators are 16" and quite chunky - I just wanted one as a model but as ever I've ended up with three - they came as a job lot - I'm still on the fence over them but I've just redone Belle's hair as it was a matted mess so I thought she deserved a new dress. I think lace yarn is often more expensive and harder to find than 4ply which is what puts people off plus all the lace yarn patterns I've made for Ell were on 1.5 needles and they are so tiny and if you drop a stitch a pain to pick it back up again easily. I agree it does look better knitting for her with lace yarn but I made some nice dresses using 4ply sock yarn - it's often a bit finer than 4ply yarn like the Baby Crofter. I do love the Baby Crofter though - I'm using the DK version for Belle. Some of the 4ply yarns seem quite thin actually, so they might look nice on Ell, but yeah, I sometimes work on those tiny needles and I shriek when I drop a stitch!